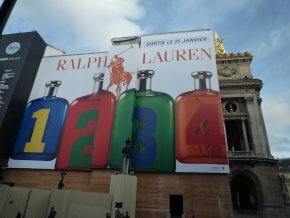 The Opera is now hidden, as is the Musée d’Orsay, by a gigantic billboard (ill. 1 and 2), while a similar advertisement draws the eye of passers-by at the corner of the rue Saint-Honoré and rue de Richelieu, at the other end of the Avenue de l’Opéra (ill. 3) within the protected perimeter of at least two historical monuments (the Louvre and the Palais Royal). 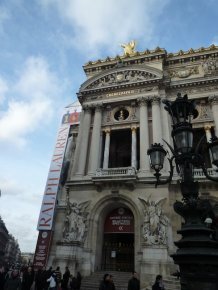 History has not changed as we see when reading, 140 years later, a text by the architect of the Opera published in the Gazette des Beaux-Arts in December 1871, pp. 490-494. We copy it below almost in full, omitting a few passages which are not directly related to the subject here, and have simply replaced some outdated terms with equivalencies (between brackets). The full text is available on Gallica. Are you not like me ; do you not feel offended by these large industrial placards spread out in the middle of our streets, which impose themselves before our eyes and spoil as many beautiful sights of our city ? This question might surprise you, but if so then too bad : because this means you have already been contaminated by the environment in which you live and the feeling for taste has been dulled in your mind. As for me, these enormous painted posters continue to cause a very unpleasant impression, painful even, and I often feel a violent resentment against the administrators who negligently allow or have allowed our city to compromise its beauty with such signs. Is this extensive public which ignores museums and is a complete stranger to aesthetics ; are all these children, who have not yet learned anything about art, not surprised by these vulgar images imposed daily upon their view ? Oh ! no, they will not be immune to the persistent influence of their environment ; if the baroque, the bizarre, bad taste and impudence dominate these commercial placards, they will become used to impudence and bad taste. This unhealthy promiscuity with ugliness and barbarism will breed indifference to beauty, and habit will soon consecrate it. Streets, squares, in fact cities, should act as professors ; our first source of education and the most persistent comes from that which surrounds us and we should not neglect these teachings provided by the public forum, because the lessons we receive, either good or bad, leave deep seeds, which will take a long time to disappear, or may never do so in fact. If you feel powerless in helping to develop these teachings, at least be strong enough to not pervert them. It is better to have an ignorant nation than a corrupt one and, even if it is only in a partial way, you are without question helping to corrupt taste by not denouncing such signs severely. Well ! No ; even if all the clothing merchants spurn me, I wish to protest and I do protest against this deplorable custom, which is in fact simply a sign of decadence which tends, alas ! to become more widespread. The provinces are now imitating Paris in this ugliness ; foreign countries are also following suit ; Italy, harmonious Italy, is little by little allowing itself to be invaded by these unpleasant advertisements […]. Let us do the same ! let us follow bad taste in fashion ! taunting beauty ! just a bit more and we can make our city the receptacle of gigantic alphabets and shapeless daubings ! […] Poor great art, you will be so distant ! and you also, dear Athenians from the time of Pericles, and you, the alluring Italians of the Renaissance, disciples of form, lovers of colour ! Turcaret will have us forget Maecenas, just like Pilotell will obliterate Phidias and Michelangelo. …Really, you find that I am exaggerating ; you think that these smears are not worth so much anger and sadness. Alas ! alas ! there are many others who think as you do and profit from these little artistic profanations. 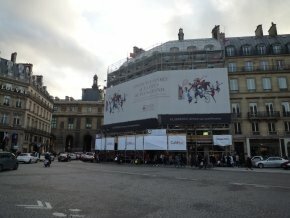 They do not care if the letters of the sign hanging on [my Opéra] are larger than [those forming the beautiful word “choreography”], and this advertisement by [Chanel] with its gold brutally glittering over [the Seine] does not really matter to them ! But did they never stop on [the Léopold-Sédar-Senghor footbridge] to admire this splendid view of Paris and curse both the [bottle] stuck in the middle of this unique panorama and [this Prefect] who is an accomplice to this act of vandalism ? To top it all off, all of the photographs taken of this ensemble which appeared abroad showed the world’s artists that, unconcerned by the exceptional and typical character of this view, Parisians accepted the bait of a few [euros] offered by someone who took the liberty of destroying the lines and the colours of [a UNESCO World Heritage site]. Ah ! if one were to glue a piece of paper on the nose of Raphael’s Madonna della seggiola, if one were to hang a rag on the tail of Coustou’s horses, we would hear loud screams, and, rightly so, the press would be unanimous in condemning this attack on beauty ; but art is not found only in the Raphaels : the silhouette of a city is as impressive as the silhouette of a statue, and you are as guilty of mutilating the latter as you are the former. Art is everywhere, it is in everything : in the street as well as in a museum, and I deny four or five [civil servants] the right to stain a city which houses [two] million inhabitants with their outrageous signs ! The tiny bell I am trying to ring might just be loud enough to reach the ears of our leaders, and they might wonder if I am not the only one making this sound, but also many others who share my impressions concerning these annoying advertisements.